Powers/Abilities: Taurey is a gifted leader, spokesman, and tactician. History: (Captain America I#194) - William Taurey bears the same name as his ancestor, a Loyalist who tried to warn the British forces of General Washington's approach, but was killed by Steven Rogers. While using the resources of the Royalist Forces of America to create Madbombs to bring about the end of democracy in America, Taurey also hoped he might find the descendent of Steven Rogers and seek revenge on his ancestor's behalf. (Captain America I#199) - Taurey had his men took Mason Harding, inventor of the Madbombs, captive while he attended a costume ball. At the appointed hour, he ordered his men to active the "Big Daddy" Madbomb to drive all of America insane. (Captain America I#200) - Taurey announced to his party guests that the Madbomb had been activated, unaware that the Falcon had already led a team of SHIELD agents to the site and destroyed it. Captain America himself infiltrated Taurey's manor and handed him a pistol, challenging him to a duel similiar to that of their ancestors. Taurey backed out, unable to face his mortality. (Thunderbolts#31) - Years later, Taurey rebuilt his organization as the Imperial Forces, and had Hesperus Chadwick design Shriequencers that would kill people with sonic attacks. From an Imperial Forces base in Oklahoma, Taurey oversaw Chadwick's efforts, and the defeat of the Thunderbolts, who had invaded their base in the hopes of freeing their comrade Charcoal, a former agent of the Imperial Forces. (Thunderbolts#32) - Taurey placed the Thunderbolts in his Kill-Derby, pitting them against the Imperial Forces' superhumans, Brute Force, and an army of Shocktroopers. When the USAgent appeared leading the Jury, Taurey contacted his benefactor, Baron Helmut Zemo, and asked for his assistance in defeating them, but Zemo refused. Taurey then realized all was lost, and abandoned the base. Comments: Created by Jack Kirby and Frank Giacoia. 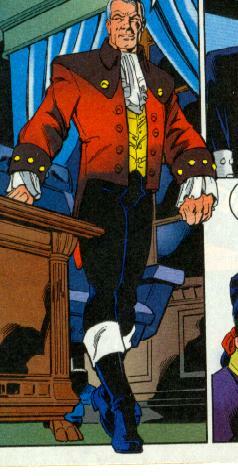 Taurey is called "Malcolm Taurey" in Captain America I#199.